17a. [Detonates a weapon in the underworld? ], BOMBS HELL (instead of bombshell). 21a. [Raises the price of some pastries? ], UPS TARTS. 34a. [Clocks trainees for a fabled race rematch? ], TIMES HARES. 43a. [Cuts up little bloodsuckers? ], CHOPS TICKS. 54a. [Puts up with one’s family? ], BEARS KIN. 61a. [Scrutinizes the underworld? ], EYES HADES. Simple wordplay, consistently crafted. The ones that end in S aren’t arbitrary plurals in the base words—if you upped the price of a single tart, that would be UPS A TART and not UPS TART; same with TIMES HARES and CHOPS TICKS (which craves the plural anyway because a single chopstick borders on useless). I will grant you that a singular “eyeshade” would be better, but Hades ends with an S so you get the plural. The only non-Tuesdayish fill is 15a: AGUE. The rest is smooth. And you get a PIRATE SHIP (not a pirate’s hip) and a RED HERRING to liven things up. 7d. [Bantu speaker of southern Africa], ZULU. Does this clue pass South African muster, Gareth? I do recall that using “Bantu” as a label for a person (vs. a language) is offensive in South Africa. 25d. [Mount Etna emission], ASH. This is a recurrent and contemporary thing. Two months ago, the ash plume reached 23,000 feet. 49d. [Diabolical sort], FIEND. This fits in well with the HELL and HADES aspects of the theme. 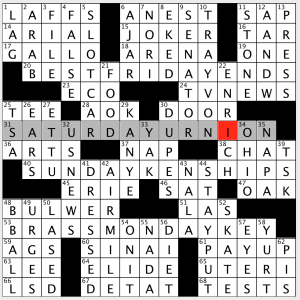 It seems as if the theme would be smoother if the Saturday entry wasn’t included, because the other theme entries are all based on days that are six letters long, so it seems as if the theme is simply to add DAY to the phrases. According to the tagline, though, the theme is to lengthen the three-letter abbreviation in each phrase to the full day. Took me a while to get it, but it’s not bad! 48A [___ -Lytton Fiction Contest (competition to write terrible prose)] BULWER – This is an example of the aforementioned trivia that I, personally, have never heard of! It is a real thing, evidently. 63A [“Chi-Raq” director] LEE – As in Spike Lee. I have heard mixed reviews of this movie. Wait until Netflix, maybe? 10D [Martin killed in 2012] TRAYVON – This is part of a list of several incidents that have spawned racial tensions in the last few years. 32D [___ & World Report (defunct print magazine)] U.S. NEWS – I thought it has been a while since I have seen one of these! How long until magazines and newspapers are a thing of the past? 34D [Where Buckeyes hail from] OHIO – Boo! Go Blue!! 42D [Unit for a frequent flier] AIR MILE – I am NOT a frequent flier, so I have next to zero air miles! 57D [“___ Wide Shut”] EYES – Stanley Kubrick’s last film. Not great, but not horrible. There is tons of symbolism in this movie. Once you’re looking for that, it seems a bit better. Yes, it’s on Netflix! A decent challenge this week from Matt. 3.9 stars from me. But that’s only because the theme confused me for a bit. Maybe others liked it more. Until next week! A fun Tuesday puzzle, and one that makes me hungry. I will list the thematic entries and that will explain my hunger pangs! 24A [Laura Hillenbrand best-seller about a racehorse] SEABISCUIT – NOT on Netflix! So we would have GARLIC SALT, SEA SALT, ROCK SALT, and TABLE SALT. Nicely done. Are you hungry too, perhaps for a some nice salty chips or nuts? I know I am! 20A [Woman in a Beethoven piano title] ELISE – I used to play this on the piano years ago! 67A [Shatner’s “___ War”] TEK – I have never read these books of his. They have only been out since 1989! 13D [Kirsten of “Spider-Man”] DUNST – I love superhero movies! Can’t wait for at least three or four good ones coming out this year alone: a new Superman, Captain America, X-Men, and others! 25D [Windy City commuter org.] CTA – I wondered how well known this would be in Los Angeles, but then I remembered that many southern Californians are from the dreary midwest! 52D [Shoulder muscles, briefly] DELTS – Another one of those muscles I don’t have! We will call it 4.o even today. Until Saturday’s LAT! I am going now to grab a salty snack! Ooh. Now here’s a type of puzzle theme I don’t recall seeing, possibly ever. Or not recently, and certainly not executed in the this particular way. What we have today is a group of themers that form a word chain (almost like an electrical RELAY…). Four two-word phrases, the second of which becomes the first of the next. So each phrase has one word in “common” with the next . ALSO, Liz has plotted these both horizontally and vertically in the grid, so the game isn’t immediately apparent. Nice “touch”! Other nice touches? I love that [Moo SHU pork] shares the “U” in FOOD SUPPLY and, given that STREET FOOD (a phenom that’s been with us a loooong time) is also in the grid, the FOODiness of the other long fill is even tastier as we’re treated to TURKEY DAY and ANGUS BEEF. 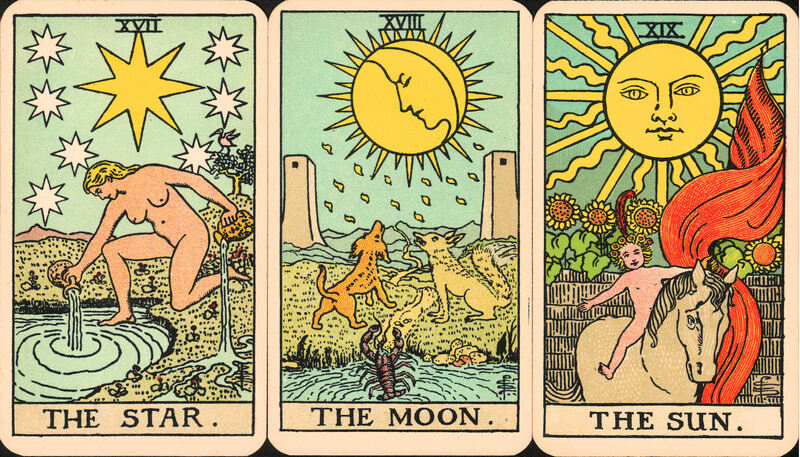 TOP SECRET and TAROT DECK also make for superb long-fill entries. And serendipitous or not, I liked the placement of RELAY right there at center. This is what triggered the thought about the non-[Pass-the-baton race] use of the word and its tie-in to the way the theme is executed. Then, when you’re [Feuding], you’re AT IT. When yer in a feudin’ mood and decide to go AT IT and you live, say, in Dogpatch, yer more likely to RASSLE [Brawl in the boonies]. Dandy dialect, that! [He’s not one to talk] for MIME. [Foot-long woolens] for SOCKS (which are the length of your foot, 12″ or not). [Back biter?] for MOLAR, one of the teeth at the back of your mouth, not a SNAKE IN THE GRASS. [Oz barker] for TOTO, Dorothy’s dog. This is not a reference to the Wizard’s having been a carny-type—but I like that the clue took me there! And that, as they say, is a wrap. Short ‘n’ sweet today. From A TO Z: from the theme to its execution, to the remainder of the fill and clever cluing, this puzz did lots to ELATE me. And as always, I hope you enjoyed the solve as well. Til next week, folks: keep solving—and let’s do this again! Today’s theme was completely telegraphed by the title. Let’s get right to it. Not the most scintillating theme, but to be fair, I didn’t find too many other M&M phrases that would work in a puzzle. I found one other instance of this theme: David Steinberg’s LAT from Mon, Oct 22, 2012. In addition to MIX AND MATCH and MIGHT AND MAIN, David used MAKE AND MODEL and MEEK AND MILD. I’ve never heard the phrase MIGHT AND MAIN but that must just be me. I believe I’ve heard of MIKE AND MOLLY, but only just barely. 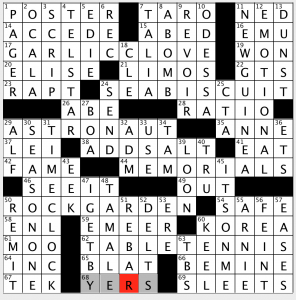 I tried to discover if there was a reason for this puzzle to appear today, like perhaps an anniversary for the popular candy, but I haven’t been able to discern one. If anyone knows, please clue me in. More than 400 million individual M&Ms are produced every single day! M&Ms are a rip-off of the British chocolate candy Smarties (not the same as the U.S. candy Smarties). The Ms are Forrest Mars, Sr. who created the candies, and Bruce Murrie, son of Hershey Chocolate’s president who had a 20% share in the product. During WWII, the candies were sold exclusively to the military. The movie E.T. : The Extra-Terrestrial approached M&Ms first, but the company rejected the offer to be included in the film. Reese’s Pieces were used instead to their great benefit. A few days ago, Mars announced it would remove all artificial coloring from its “human food products”, including M&Ms. 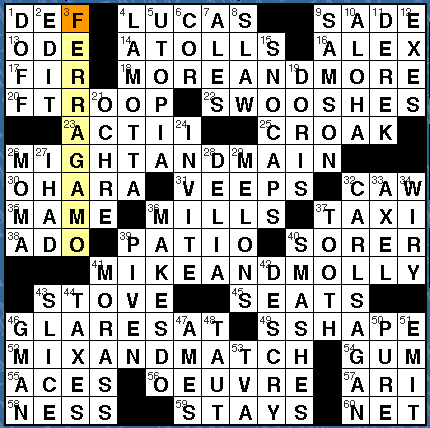 Nice to have CARL SAGAN (32D [“Broca’s Brain” writer]) appear in the puzzle. 3D [Italian luxury goods brand] started out looking like FERRARI (no doubt, by design) but ended up being FERRAGAMO. I don’t know the brand, but I am familiar with Vince FERRAGAMO, former NFL QB in the 70s and 80s. Other good fill: SNO-CAPS (hey, I thought we were honoring M&Ms here! ), LAMOTTA, UTOPIA, SWOOSHES, and SMASHES. Challenging clues for a Tuesday: Double [Harsh cry]s for 25A CROAK and 32A CAW, [1966 Jerry Herman musical] for 35A MAME, [Novelist Lessing] for 29D DORIS (she won the Nobel Prize in 2007), [Writer Ephron] for 28D DELIA (I only know Nora; didn’t know she had a successful sister as well), and [Catch sight of] for 42D DESCRY (not an everyday word). Basic theme, but solid puzzle. Good day, everyone! Short write-up for today, but loved the theme, brought to us by Mr. Bruce Venzke: famous performing couples from yesteryear! STEVE AND EYDIE (20A: [Singing couple of old]) – Steve Lawrence and Eydie Gormé. FRED AND GINGER (38A: [Dancing couple of old]) – Fred Astaire and Ginger Rogers. PAUL AND JOANNE (57A: [Acting couple of old]) – Paul Newman and Joanne Woodward. Not the most FLASHY of crosswords in terms of construction, but definitely flashy in terms of the people referenced in the themes (1D: [Flamboyant]). Different way to clue EARTH was pretty welcoming, though, if I was asked that as a trivia question, I wouldn’t have been 100 percent sure I would have nailed that question on the first try (56D: [Fifth-largest planet]). Don’t think I’m too much of a fan of the plural of sleet, SLEETS, despite its legitimate usage (50D: [Icy downpours]). If I could reach out to my old program director down in Salisbury, MD, I would have him send the tapes of of reading PSAs that ran on the radio (42D: [Pro bono TV spot]). But I’m sure that if I listened to them now, I would cringe, as my voice was so much more high-pitched back in 2007. Now? It’s still pretty high-pitched! “Sports will make you smarter” moment of the day: MAYOR (68A: [La Guardia was one]) –Seven-time NBA All-Star and Hall of Famer Dave Bing and three-time NBA All-Star Kevin Johnson have more in common than just being great basketball players. Both of those players went to become mayors in big cities: Bing became MAYOR of Detroit after the resignation (and conviction) of Kwame Kilpatrick in 2008, and then won election in 2009. (He did not run for re-election in 2013.) Johnson is currently the mayor of Sacramento, Calif.
See you at the top of the hump tomorrow on Wednesday! This entry was posted in Daily Puzzles and tagged Bruce Venzke, Elizabeth C. Gorski, Kurt Krauss, Lynn Lempel, Matt Jones, Melina Merchant. Bookmark the permalink. NYT: very well done! I really enjoyed it. I thought 21A could have been clued ” Derek’s groupies:” and 49D a tip of the hat to Amy. Agree. 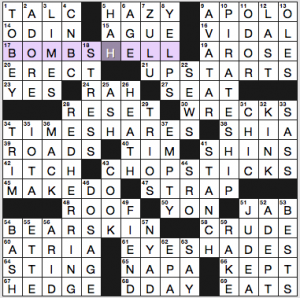 A lovely NYT crossword today. 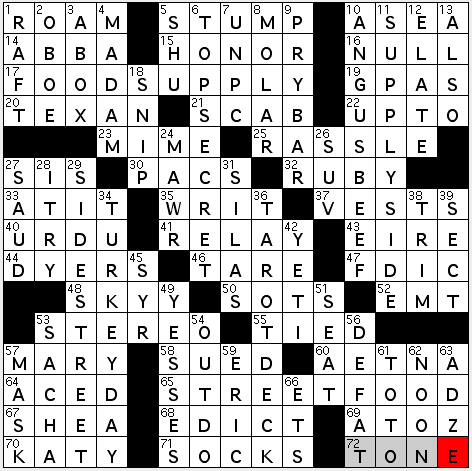 Jonesin’: Did enjoy that all themers were in order and considering that the app that I use considers the puzzle’s release to be Thursday, going from Friday to Monday was pretty cool. LAT: Mike and Molly is a very popular TV show in the U.S. probably (as with most very popular U.S. shows) heavily based on some very popular U.K. show from 5 or so years ago. It stars Melissa McCarthy who has been in a bunch of movies in the past few years. I have not seen the show, but have seen tons of commercials for it especially since it is also in syndication. I’m not an expert on South African politics, but I interpreted the NYT clue as “speaker of a Bantu language of Southern Africa,” like an “English speaker” is not necessarily English. This isn’t great, because Bantu is not a language, but I got the impression it was in good faith. Looks like the constructor’s (pseudo)name is a theme answer in the WSJ, as well. This Tuesday NYT (an overdone theme) proves my point that some constructors will always be favored for publication. 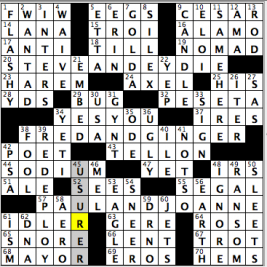 As per his feedback, Mr. Shortz looks for fresh, exciting, interesting puzzles. This puzzle is none of those things. I agree, m.d. : “boring” in terms of theme, anyway.